Those of you that have been reading this blog for a while know this already, but for those who don’t, let me explain how I cook: super fattening and over-indulgent desserts which I don’t touch because I am perpetually on a diet and then I make relatively healthy real food, which is what I eat because I am perpetually on a diet. Pay attention. Back to cookbooks, here’s why that was important to know: I finally found a cookbook which made me flip through the pages, planning to make almost every recipe in it. Levana Kirschenbaum’s Whole Foods Kosher Kitchen is a little peek into the way a woman who’s entire career revolved around food managed to achieve and maintain a healthy weight. This cookbook isn’t a diet cookbook, but rather a book that’s chock full of recipes for foods that are plain and simple good for you. Pantry staples section: there is a section full of pantry staples/ edible gifts, which includes recipes for all kinds of sauces people generally buy, a ton of delicious salad dressing recipes, and great spice mixes, among other things. Levana is of Moroccan heritage, so she definitely brings those flavors, but she also brings an amazing array of international flavors to the party. One of my culinary goals is to learn more about international cuisine, and I have my eye on some great looking recipes in this cookbook. For people who are gluten free, she includes gluten free options and adaptations for a ton of the recipes. Similarly, if you observe Passover, there are lots of options included for that, and tips for converting many of the recipes. There is also a Passover index in the back to make it all clear. If you are thinking that you don’t keep kosher, so this book doesn’t apply to you, think again. While there are some traditional Kosher recipes in this book, there are loads of recipes that anyone, kosher or not, would be thrilled to try. My feelings about this book were overwhelmingly positive, but here are a couple of things I would point out. Firstly, we are very spoiled nowadays, expecting full color pictures of every recipe. This cookbook doesn’t have pictures of every last recipe. (The pictures it has, however, are eye catching and beautiful, and kind of make you want to dig right in.) Also, because this is a good-for-you kind of cookbook, there aren’t a lot of super indulgent desserts. (Not that people should really be eating those, but if you are looking for those recipes, this isn’t the cookbook for you.) Lastly, there are some recipes in this book that call for unusual (for me) ingredients. I think that’s two parts good and one part bad, because it encourages you to try new things, but I am a little timid in the palate department. Overall, this is an excellent cookbook for anyone (kosher or not) who wants to eat food that is better for you. To purchase a copy, click here. Disclaimer: I was provided a copy of this cookbook for review, but the opinions are honest and my own. Heat the olive oil in a small pot. Add sliced mushrooms and sautee on medium flame until the liquid given off by the mushrooms is evaporated. Stir occasionally. Remove mushrooms from pot and set aside. Heat the second bit of olive oil in the same pot. Sautee onions over medium flame until golden brown, stirring occasionally. This should take about 20 minutes. Don’t try to rush this, as the onions get more flavorful as they cook and get darker. Remove onions from pot and set aside. 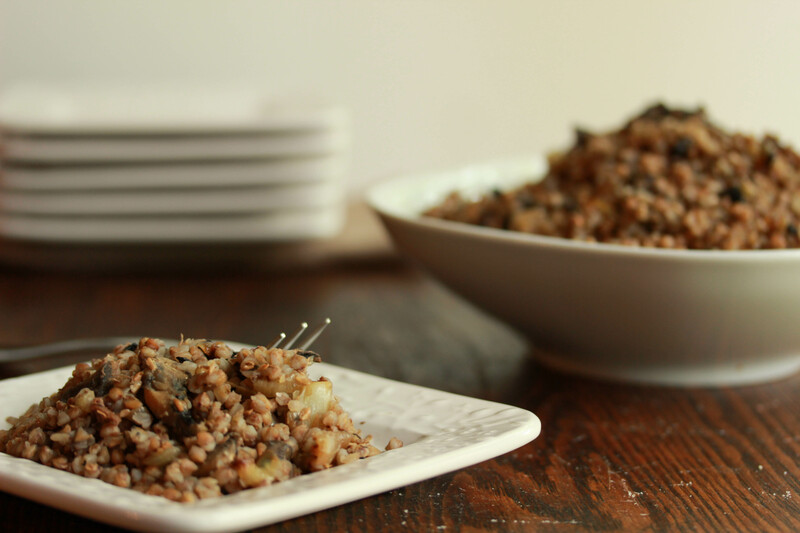 Place the kasha in the pot and toast until the grains are slightly browned and fragrant. Add the egg and stir quickly until the grains are uniformly coated. Add the boiling water and cover the pot. 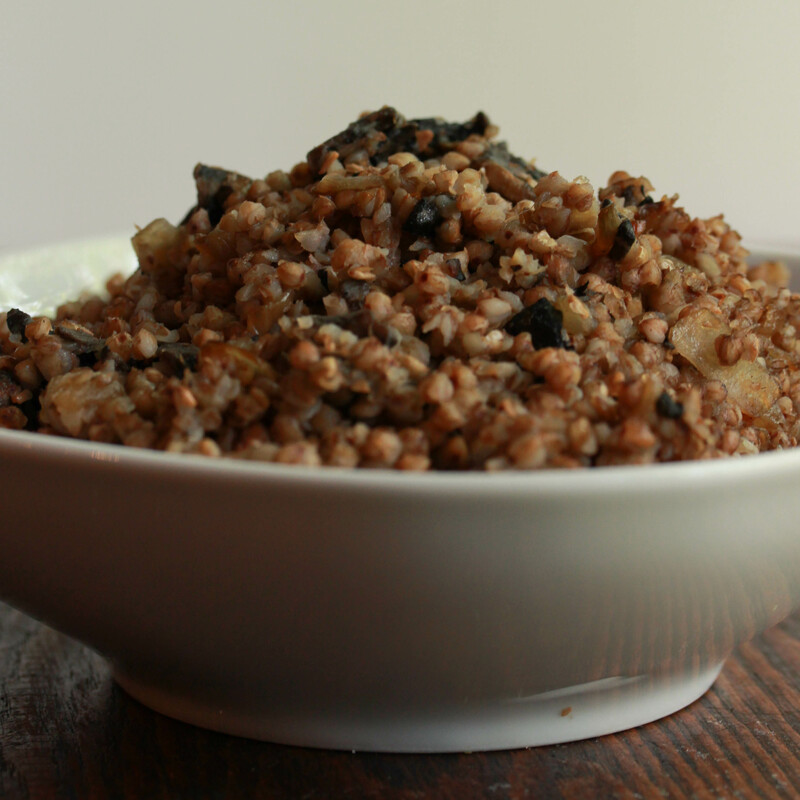 Reduce the heat and let it cook for about 15 minutes, until the water is absorbed and the grains are soft. Stir in the reserved mushrooms and onions, add salt and pepper to taste, stir and enjoy. This dish is best served hot, but I had it cold the next day for lunch alright, the next three days and it was delicious that way too. 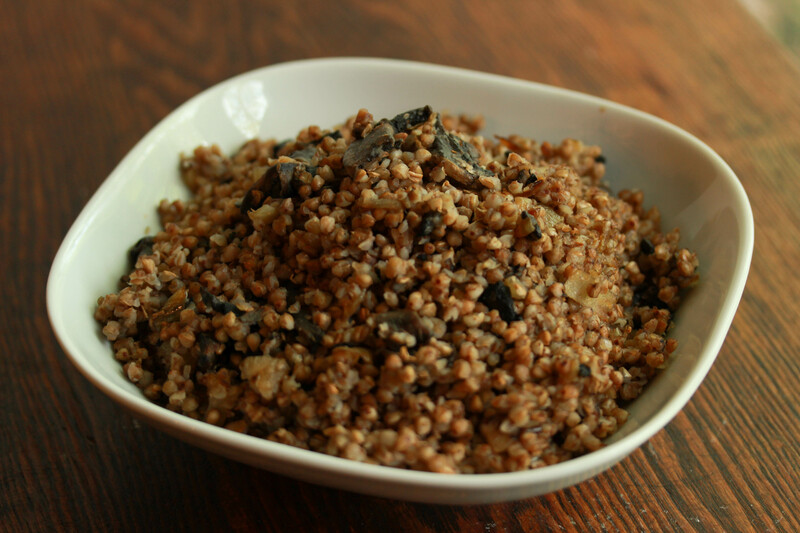 As noted in the cookbook: For other grains, such as quinoa or rice, follow the directions above, but omit the toasting and coating with egg step. Also, adjust the amount of water and cooking time. I can sooooo relate! I also like making decadent desserts, but I also want to lose weight and need to make healthy dishes. The kabocha and sweet potato soup from Levana’s book is fantastic, btw. Good to know- I’ll definitely have to try that soup soon! I have the same philosophy…I made all kinds of decadent desserts, but eat mostly healthy stuff. This dish looks fabulous…and I’d be willing to eat it day after day! Novel way of dealing with Buckwheat. I will need to try this out! What purpose does the egg serve? Is it supposed to have a very soft mushy texture?